For ACG, one of the most rewarding aspects of being in a big, diverse community like Austin is the opportunity to build relationships with other local organizations. We first partnered with American Gateways last summer for i/we, and are thrilled to be collaborating with them again for our upcoming presentation of dream. 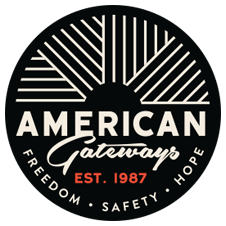 We recently spoke with Lora Petty, their Development Coordinator, who told us about some of the work American Gateways is doing in central Texas. I’ve been employed with American Gateways for about twelve years. I first did direct client services, and recently I transferred into a development role. American Gateways has been providing services for over 30 years to the central Texas immigrant community. We started out providing asylum – we used to be called the “Political Asylum Project of Austin.” Now we provide a lot more immigration services, some of which have been brought to light in recent weeks. We assist parents who have been separated from their children at the border, offering legal representation to adults trying to reunite with their children, and work within family detention centers. We also assist Dreamers through DACA – one of our DACA clients is a participant in dream. There are special applications available to immigrants who have been victims of crime and violence in the United States. The job I had previously was to help file immigration petitions related to being the survivor of a crime. It’s great to be able to see lives change, to see some positive outcome. Good news is few and far between, but when it comes, we rejoice in it. Many years ago, one of my clients was a victim of a domestic violence incident. She called the police, made a report, and was helpful during the investigation. Some time later, she found out about American Gateways, and we were able to help her file the application for a U Non-immigrant Status, or “U Visa”. The purpose of the U visa is to enhance community policing and to have a safer community for all. A U visa encourages immigrants who have been victims of crime to file reports, because immigrants are often too afraid to contact police out of fear of deportation. This individual was brave enough to make that report and help the prosecution with the case, and the individual who perpetrated the crime served jail time. When she was eventually found eligible for the U visa, she had a lovely husband whom she was able to petition as well. Now, as a family, they own a home, contribute to their community, and have work permits. It’s really a lovely story about an unfortunate victim of a crime who was then able to receive the benefits of a U visa. Unfortunately, it all comes down to being the survivor of a traumatic event, but it is so rewarding to see the clients gain work permits, gain permanent residency, and gain citizenship.